Burnaby RCMP have started the process of evicting protesters from Camp Cloud, the protest camp set up in opposition to the Kinder Morgan Trans Mountain pipeline expansion project. Panesar said 11 people were removed and five people were arrested without incident. She said a family of four living at the camp is now being assisted by social services to secure emergency shelter. 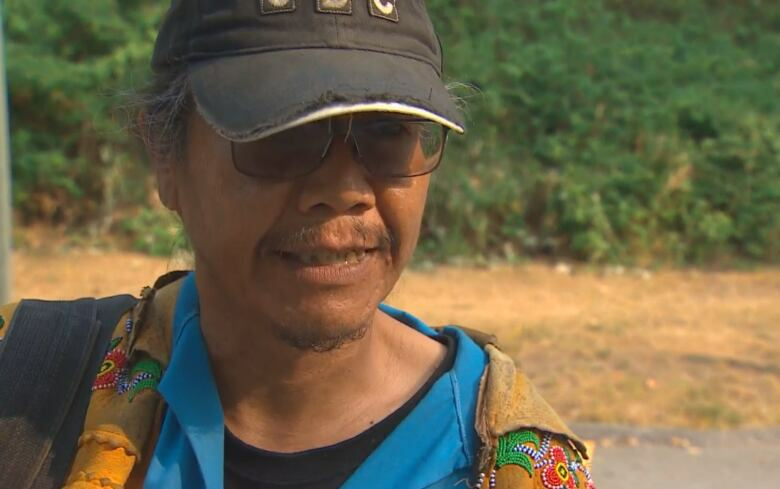 George Manuel of the Shuswap Nation, who has been living at Camp Cloud for the past four to five months says he was one of the protesters arrested. He says the eviction won't stop his protest. "Camp Cloud is not going anywhere," Manuel said. "A cloud — it can dissipate. It can come apart and become more than one cloud. It can be many things ... we are not going anywhere." On Aug. 10, B.C. Supreme Court Justice Geoffrey Gomery granted the city an injunction ordering all camp structures, shelters and vehicles be removed from outside the Kinder Morgan tank farm within 48 hours. Since the deadline some protesters have remained at the camp in defiance of the order, maintaining the court does not have jurisdiction over the site. In a statement, Burnaby RCMP said there will be an increase in police presence in the area and it will be bringing in equipment and personnel in conjunction with the CIty of Burnaby to start removing structures. The area will be under an exclusion zone until the camp is cleared, and once completed, the police say the public will be able to re-enter the camp where "peaceful, lawful and safe" protest can resume. RCMP have also blocked media from entering the zone. Crews from the City of Burnaby are on site to dismantle the camp. Dipak Dattani, director of corporate services, says crews will likely be on scene all day. "There could be hazardous materials that we have to look for. There could be materials — needles or other things — that we would have to be cautious about," Dattani said. "Once we identify everything is safe and ready to go, we'll start taking stock of information and taking photographs, removing the materials and looking at dismantling." Burnaby resident John Templeton — who lives close to the campsite — said the eviction is long overdue. "When you have trouble, you nip it in the bud," Templeton said. "We've been severely impacted by the protesters in our neighbourhood. It seems the approach by the city has been to aid, abet and accommodate the protesters over the rest of the neighbourhood who are taxpaying citizens." Tzeporah Berman, director of the environmental advocacy group Stand, was at the site when the arrests began. "The police presence was massive. I don't even know how many trucks or officers and they came in," Berman said. Despite that, she said the arrests are not surprising. "Certainly there's been an understanding for some time that the injunction was going to be enforced," she said. "They were going to be asked to leave and they stayed, so they were arrested." Camp Cloud started in November with a single trailer but has grown to include a two-storey wooden structure, a cabin, an outdoor shower, more than a dozen tents, and multiple vehicles and trailers. As of Wednesday, there were about a dozen or so protesters living at the camp including the family with an eight-year-old child. According to information received from Burnaby RCMP, an earlier version of this story said seven people were arrested. In fact, five people were arrested, RCMP later confirmed.